There's always something a little unfair about when a family has multiple successful, brilliant and highly achieving children. You mean that the Sedarises get two comedic geniuses?! The Quaids get Dennis and Randy? Mona Simpson is Steve Jobs' sister and they didn't even know it until adulthood because Steve Jobs was put up for adoption as a baby?! All my poor mom gets is an internet writer who complains a lot and occasionally gets caught eating food that she finds stuck to her own skin. How is that fair? Oh, and look — now the Colberts are coming along to rub in her child's failure even worse. Great. As we all know, Elizabeth Colbert Busch, sister to comedian/satirist/genius Stephen Colbert, is running for Congress in South Carolina and now she's one step closer to achieving her goal. Last night, it was announced that Colbert-Busch had won the Democratic primary, beating out her competitor with a whopping 95% of the vote. 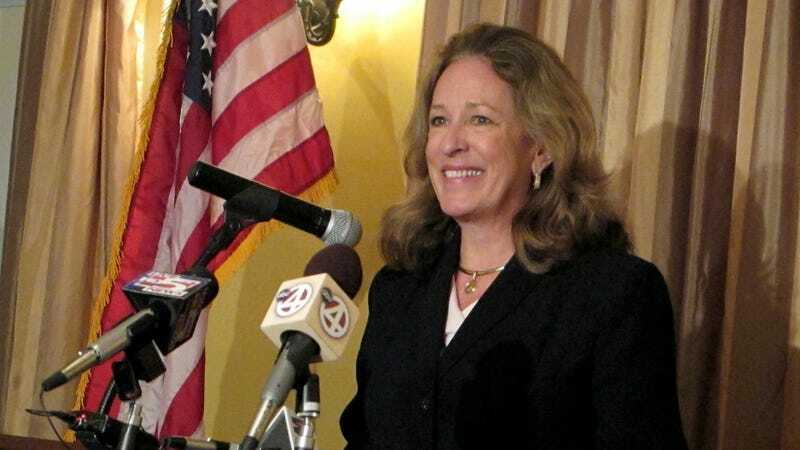 Colbert Busch, a business woman, is running on a largely non-partisan platform of job creation. She will face-off against the winner of the April 2nd Republican run-off in a general election on May 7. Analysts project a Republican win, but who knows — people also said that Stephen Colbert wouldn't get his Super PAC and look at him now.